Digital Projection International was founded with one key objective, to innovate the capabilities of large-screen displays with the latest advancements, when other companies were still using 3 gun CRT display. Since 1987, when DPI and Texas Instruments joined forces to develop the Digital Micromirror Device, and other technologies for large-venue projection applications; after ten years of exhaustive research and technical innovation, Digital Projection introduced the first 3-chip DLP projection system in 1997, thus ushering in a new era of digital imaging. All their optical engineering for the lens are done strictly in-house, for maximum quality control. 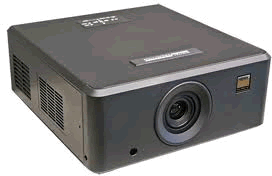 Digital Projection projectors are now found in every type of venue from professional applications, such as ESPN Studios and NFL Films, to Home-Theater, and even military and government installations. In fact, Digital Projection is the ONLY manufacturer to receive two EMMY Awards for Theater Projection technology! They remain the first and only manufacturer to win this coveted award. Their relentless pursuit of innovative technology, unmatched customer service, and their unwavering promise to anticipate the needs of the industry assure Digital Projection will remain the leader in projection system development and customer satisfaction! 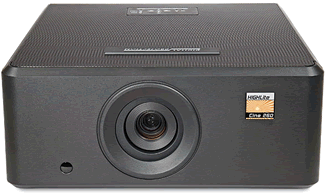 The Digital Projection HIGHlite Cine 260 is an excellent choice for either dedicated Home-Theater systems or Family Rooms, with screen widths up to 18 feet! This projector offers astonishing depth of color and superior brightness, and will deliver an experience that is nothing less than extraordinary! The CINE 260 DLP projector has an exceptionally bright output, that delivers dazzlingly bright images with excellent image fidelity that only a three-chip DLP projector can provide! The imagery benefits from the HIGHlite Cine 260 are numerous; to display an image that looks true to life, a projector must exhibit a broad color range, an accurate color temperate, and a high fidelity tonal reproduction, all working in harmony with each other. Digital Projection achieves this critical balance by pairing their broad-spectrum Xenon lamps and long life HID illumination systems with optical components that match the latest video standards. When complemented with their proprietary digital signal processing, the resulting imagery, comprised of billions or even trillions of colors, demonstrates an engaging film-like appeal that must be experienced! The level of color depth and saturation the Cine 260 offers you is astounding, and it lets all of your movies appear to come to life! By utilizing the incredible efficiency of a single lamp, the HIGHlite Cine 260 produces stunning imagery, while consuming a fraction of the wattage of similar projectors. Their commitment to developing powerful, efficient and responsible products is exemplified in all of their displays, while delivering maximum lumen output with minimal energy consumption. Digital Projection's attention to detail, from design to production, assures you amazing images, one movie after the other! On display in our new state of the art home theater with a 115 inch Stewart film screen, McIntosh MX-150, McIntosh XR-200, McIntosh XCS-200 and J L Audio F113 subwoofers.